ATV Trailer Plans - Build Your Own Mulit-purpose ATV Utility Trailer. 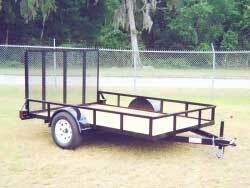 You can use our recommended ATV Trailer Plans to build your own ATV trailer for hundreds of dollars less than you would pay a dealer. And the best way to do that is to start with a good set of plans. The ATV trailer above is a 6 x 10 foot with a ramp/gate, which will carry most ATVs. We think if you're going to invest in a trailer it might as well be useful for as many things as possible. That's why we recommend one as pictured above. The solid deck gives you the ability to haul much more than just your ATV. The full width ramp makes it much easier to load and unload other items. The custom link below includes listings to the best deals we could find on ATV and utility trailer plans that are relatively easy to build. You do need some mechanical ability and a usable set of basic tools. So to help you get started we searched out the best deal on ATV trailer plans. You want plans with detailed step-by-step written instructions, shop hints and notes, detailed CAD drawings with 3D illustrations, suppliers list, wiring diagram, safety sheet and complete materials and parts lists. And that's exactly what we've found for you! How to build your own ATV trailer. If you don't feel comfortable attempting a project like this, there are some alternatives. Just do what you can accomplish on your own, and then hire someone to finish the things you don't want to tackle. We know of several guys that did all the measuring, cutting, and basic assembly, then hired out the welding. Nothing wrong with that, and you still save several hundred dollars. If you don't have welding experience, this is actually the process that we recommend. The other things you'll need in addition to the trailer plans are trailer parts. Since we don't want to leave you hanging, we have a custom link with the best prices on all the trailer parts you're likely to need. Just take your time, follow the plans carefully, don't scrimp on quality parts, and almost anyone can build an ATV trailer that will provide years of use. Factor in the dollar savings, and sense of personal accomplishment, and there's plenty of reasons to do it yourself. Well, it looks like we're out of reasons not to get started!